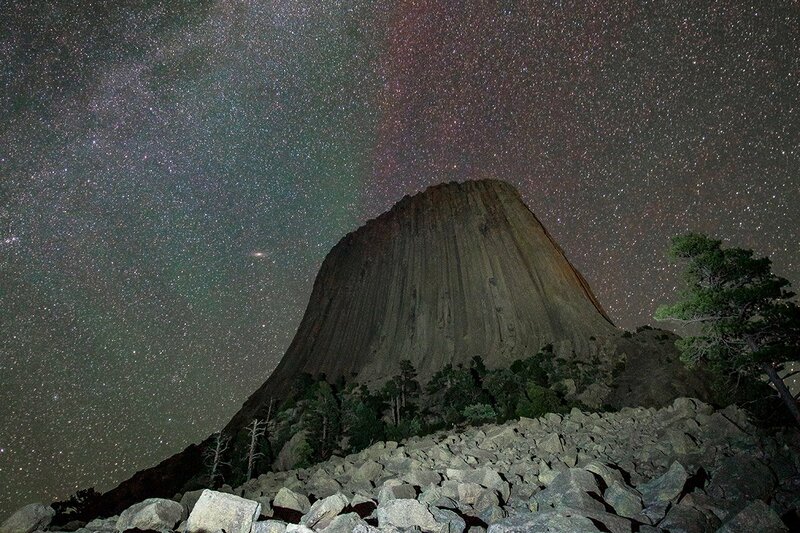 Devil's Tower, Wyoming. All photos by Eric Adams. Keen on trying out astrophotography on your next trip? Getting your camera settings right is one thing. Producing a great image is another. Popupla’s Daniel Schwartz talked to photographer Eric Adams about how he took this photo of the night sky, and how anyone can do the same regardless of camera gear or shooting conditions. Takeaway: Always be willing to experiment. Beautiful shot. Talk me through how you took it. It was late August, and I was driving home from observing the total solar eclipse in Wyoming. 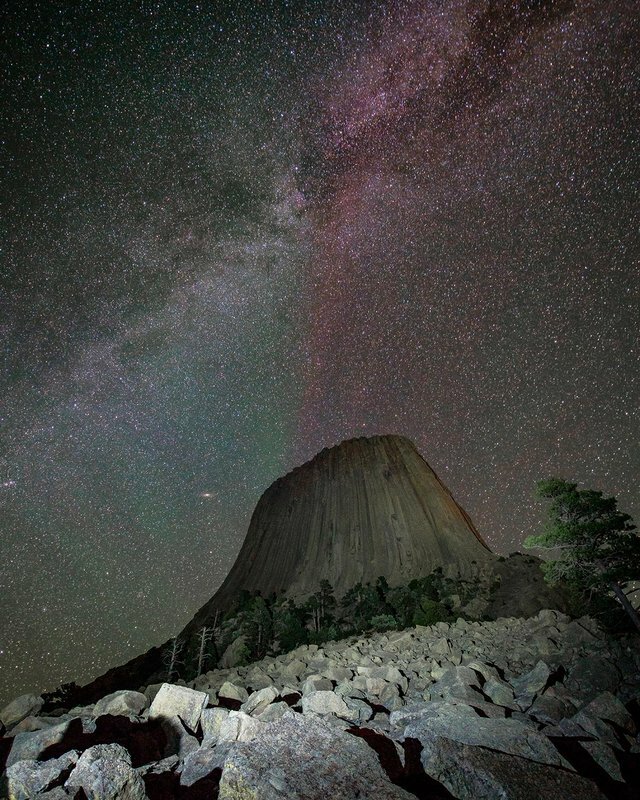 I was solo — my family and friends had flown home — so I decided to fold in a visit to Devil’s Tower even though it was eight hours out of the way. I’d always wanted to see it, and there was great weather in the forecast. 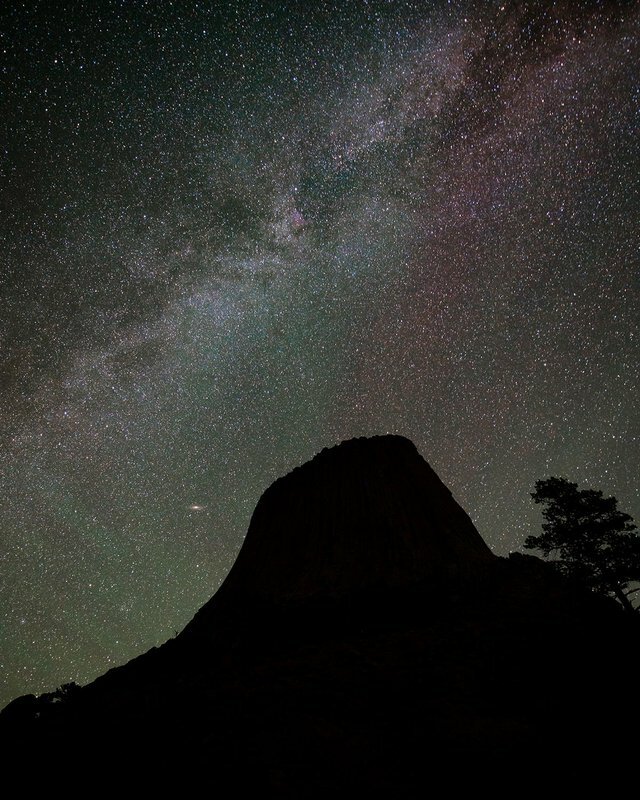 I spent the day exploring the terrain around Devil's Tower, and at nightfall went to a popular spot among local photographers to shoot it against the night sky. At that time of the year, the Milky Way sat far away from the Tower in the late evening, so the juxtaposition I’d been hoping for simply wasn’t possible. After I got some shots at the location, I decided to go check out the visitor center parking lot at the base of the Tower on the opposite side. There I found a nice view of both the monument and the Milky Way, even if it wasn’t the really dense galactic center that shows up so well in photos. And click, a frame-worthy photo was born. Was that it? Not quite. The challenge here was getting the Tower to show up in the image. If it’s not lit up, it will appear as a mountain-shaped absence of stars. I tried light painting, in which you use a flashlight or other light source to illuminate a subject by sweeping the light back and forth across it while the shutter is open. It’s a good way to light a scene without blowing it out the way a flash would. Because the Tower is so tall and relatively far away, I didn’t actually think it would work. I tried for the hell of it, and, well, it worked! I was shocked I was able to light up a whole mountain with a small LED flashlight. It took about fifteen tries to find the right balance of lighting on the foreground boulders and the tower behind them. The trick was to illuminate the boulders briefly and then concentrate on the tower. I made three or four passes with the torch on the tower, then shut off the light. It was only about five seconds of illumination during the 25-second exposure. Devil's Tower before light painting. Devil's Tower after light painting. Bravo! Now let’s talk gear. What were you packing? I used a full-frame , which has great low-light capabilities and high dynamic range, with a Nikon 14-24mm f/2.8 lens, which has a nice wide field of view without too much distortion. They were mounted on a Gitzo carbon fiber tripod with a . The flashlight was a bright but compact LED light typically used as a military or tactical light. And what were your camera settings? A 25-second exposure at ISO 4000 shot wide open at F/2.8. On the RAW file in Lightroom, I made subtle adjustments to contrast, brightness, clarity, and a few other settings. I also adjusted the highlights to help even out the light painting. (The foreground boulders were much brighter than they appear in the finished edit.) I also used the software’s noise-reduction controls to minimize the graininess that results from high-ISO imagery. Could I pull off this kind of shot with any kind of camera? Yes. As long as you’re on a tripod and can set the exposure for up to 30 seconds, you can pull in lots of light and have time to try things like light painting for foreground objects. Keep in mind ISO: Start at 1000 and bump it up or down accordingly. You’re pushing it too hard if you see lots of grain. Some of that can be smoothed out in editing, but you want to get it right in the image itself as much as possible. You can even use a smartphone. You’ll just need to download a professional camera app, which will allow you to adjust exposure, aperture, and ISO. Again, experiment. You could get a muddy, useless image, but it's also possible that the conditions and ambient lighting will give you something great. A few other tips: The stars move with the Earth’s rotation, so experiment to see how long you can keep the shutter open before light trails form. The wider your lens, the longer you can go. You need really dark skies for lots of stars (or the Milky Way) to register in the image. You’ll struggle in light-polluted suburban areas, but in the country, you’ll have the opportunity to capture stunning images. Bottom line: Experiment. If you have clear skies and a warm coat, you can try tons of strategies and settings.